and advice on flood protection information, products and services. Flooding is the overflow of excess water from a water body onto adjacent lands. FEMA more specifically defines a flood as a general and temporary condition of partial or complete inundation of normally dry land areas from (1) the overflow of inland or tidal waters or (2) the unusual and rapid accumulation or runoff of surface waters from any source. One or more water bodies can contribute to flooding at a given site — a river, stream, ocean, bay, lake, pond, storm water retention/detention area, etc. — depending on local topography and hydraulic/hydrologic conditions. contamination of the building due to flood-borne substances or mold. The likelihood and impacts of these damages can be minimized through the use of siting, design, construction and maintenance practices appropriate to floodplain areas. In the United States, these practices are based largely on the National Flood Insurance Program (NFIP) and its regulations governing land management and use (44 CFR Part 60). Note: The passage above is an excerpt from the Whole Building Design Guide article titled "Flood Resistance of the Building Envelope". Please click here to read the entire article in a new window. Before a floodproofed building is designed, numerous planning considerations, including flood warning time, uses of the building, mode of entry to and exit from the building and the site in general, floodwater velocities, flood depths, debris impact potential, and flood frequency, must be addressed to ensure that dry floodproofing will be a viable floodplain management tool. These critical considerations are discussed within this bulletin. In the FEMA publication “Floodproofing of Non-Residential Structures,” floodproofing is described as a combination of adjustments and/or additions of features to buildings that eliminate or reduce the potential for flood damage. Examples of such adjustments and additions include anchoring of the building to resist flotation, collapse, and lateral movement; installation of watertight closures for doors and windows; reinforcement of walls to withstand floodwater pressures and impact forces generated by floating debris; use of membranes and other sealants to reduce seepage of floodwater through walls and wall penetrations; installation of pumps to control interior water levels; installation of check valves to prevent the entrance of floodwater or sewage flows through utilities; and the location of electrical, mechanical, utility, and other valuable damageable equipment and contents above the expected flood level. Floodproofing components for an individual building may also include floodwalls, small localized levees, or berms around buildings. However, because such components are not part of the building itself, they are generally not credited for the flood insurance rating of a building under the NFIP and are therefore not detailed within this bulletin. 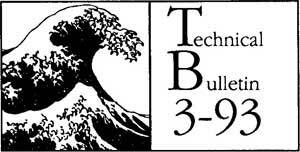 Please see below for a complete copy of TB 39-3. The NFIP allows a new or substantially improved non-residential building in an A zone (Zone A, AE, A 1-A30, AR, AO, or AH) to have a lowest floor below the base flood elevation (BFE), provided that the building has been designed, constructed, and certified to be floodproofed and to meet established criteria. Floodproofing of areas below the BFE in residential buildings is not permitted under the NFIP. In a Coastal High Hazard Area (Zone V, VE, or V 1 -V30), construction or substantial improvement of a building with a lowest floor elevation below the BFE is not allowed, regardless of any floodproofing techniques employed. Most flood-related deaths are due to flash floods. 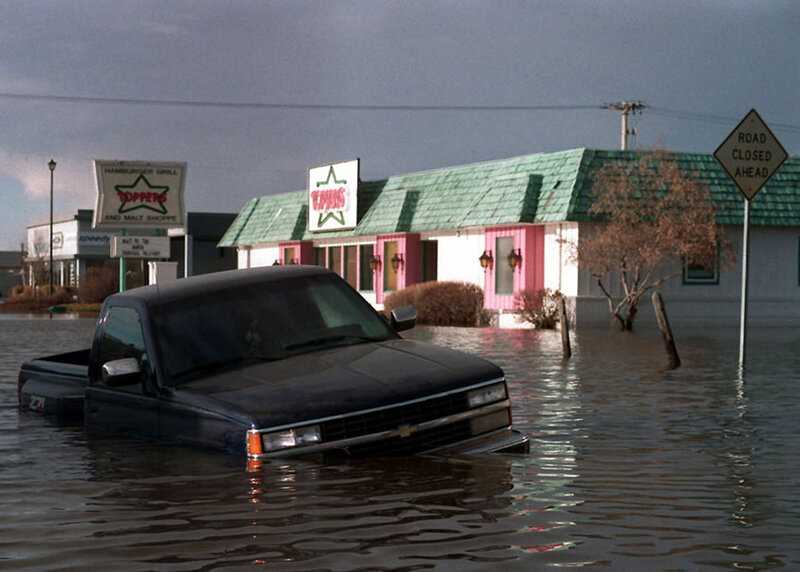 Fifty percent of all flash-flood fatalities are vehicle related. Ninety percent of hurricane fatalities are the result of drowning. 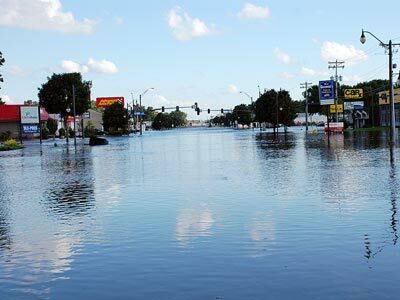 Most homeowners insurance policies do not cover floodwater damage. 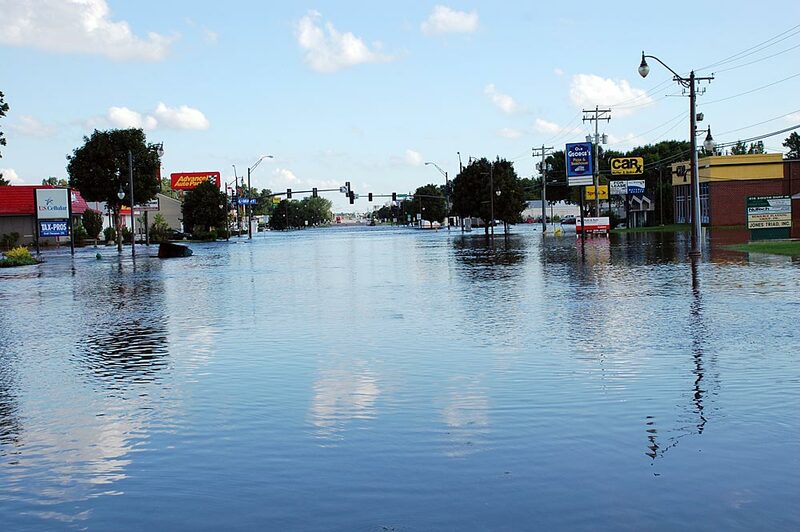 Individuals and business owners can protect themselves from property losses by purchasing flood insurance through FEMA's National Flood Insurance Program. Ames, IA, August 11, 2010: Duff Avenue is impassable as the waters of the Squaw Creek flood Ames businesses. Record flooding swamped the city after back-to-back-to-back storms. Photo taken by Jace Anderson / FEMA. Click image to enlarge. A partially submerged truck in front of the former Toppers restaurant in Grand Forks, North Dakota a few weeks after the 1997 Red River Flood. Photo taken by Matthew J. Hannen on April 30, 1997. Click image to enlarge. Flood-Barriers.com is presented by flood protection experts Flood Panel LLC. Please click on the logo below to visit FloodPanel.com and learn more about our flood protection products and services.